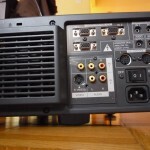 Sanyo XG-NV2E Beamer – old but working! The best things are the things you dont have to pay for. Air, Water (not yet), Love (in most cases not), and, my new beamer which has been given me as a gift. Ok, its probably not a _new_ beamer, but it’s a new one for me! I do not know the exact age of my new toy but I think it’s about 10 years old, probably one of the first beamers with 3 LCD technology. The lamp inside has done already 1532h of the estimated 2000h. A new lamp is about 450 (!) €. More information/technical data about it: here. 450 € for a new 120W UHP lamp is much money, especially for such an old machine. Because it’s only worth about 75 € (saw it on the Bay), and besides that I usually do not sell gifts, I’m thinking about modding that thing! Modding? Yes Modding! 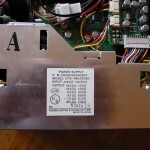 A nice place to find information about modding a beamer or build up a really nice beamer from scratch is the DIY-Community. First thing I’ve done after doing a test run was to disassemble it and to take photographs. Important is to reduce the noise this thing is generating, so I want to replace the fans inside with newer ones, hopefully more silent ones. But as you can see on the photos, this is probably not so easy. Perhaps I will only replace the fans on the back and the bottom side, they are blowing out of the housing, so probably the ones you can hear mostly. But, not so easy again, the fan on the bottom side is under the whole electronics inside, you have to remove alle the guts to replace it. A lot of uncomfortable work! The other thing is the huge price for a new lamp. But other people do not want do pay this much for a new lamp also. 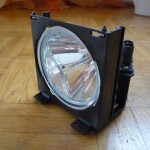 The idea: removing the burner out of the reflector of an original lamp and replacing it with a Xenon light. Xenon lights have the right color temperature and do not consume excessively much power (35 W / 50 W are enough). You can get a Xenon kit (usually used for cars) for about 60-80 €. A kit consists of a Xenon bulb and the ballast you need. You see a replacement bulb is affordable. The replacement of the UHP burner may be some challenge because it’s glued in with gypsum and you should glue in the Xenon bulb with gypsum again because of temperature stability reasons. The ballast is usually driven by 12 V, but I’ve heard there are also 230 V models available. Inside the beamer there’s not much space left, so it could be hard to fit the needed electronics in there. Another task is to make the beamer work without the original burner (he will miss it!) and to integrate the lamp in a way that it will turn on and off only when it’s supposed to be. You see it’s no afternoon project, perhaps no weekend project either. I will look foor some fitting ultra-quiet fans at first – the Xenon part of the modding is delayed until the original lamp dies. If you have experience doing such things, pls let me know! 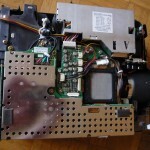 So you might have read about it already https://blog.chris007.de/?p=5 but to say it once again: i wrecked my diy-projector. totally my fault. nothing to repair. so i spent some time searching for an alternative and looked for a new display. 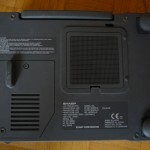 But since they are about 50Eur i figured, why not look for a used old cheap real projector with some hour on it. So my research brought up a model from Acer called XD1150. 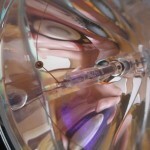 A very good site with details, calculators, comments and links to new bulbs is http://www.projektoren-datenbank.com/pro/. Just enter ‘acer 1150’ where it says ‘Projektor Modell Suche’ and the model will show up with its specs. – resolution and the technique were not a priority criteria. The XD1150 seemed to fit all of those so i looked around, and found a used model with 450h on the lamp (so theoretically another 1550h left) on ebay for 230Eur incl. shipping. At amazon.de you pay about 250Eur to 280Eur for an 1150 and about 310Eur for an 1160, which is basically the same model with more inputs and batterysafing-mode (3000h on a single bulp). A friend of mine tried the XD1160 and is very happy (after 150h of bulptime). 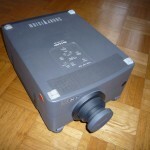 New bulps can be purchased for example here: http://www.hcinema.de/lampen/index.php?id=2502 for about 140Eur. 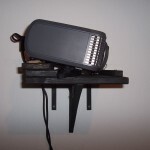 So lets let the numbers talk: the projector is 250Eur and will last (pessimistically) 1500h. It consumes about 230W while running which adds another 345kWh to the equation. Lets say the kWh is at about 20ct (again, pessimistically, see wikipedia) so the powerconsumptions costs 69Eur. That added up with the initial cost shows us that the hour runtime costs about 21ct, a reasonable price for your own homecinema! Just imagine you watch 3h (like 2 movies) a day, thats still 500 days or 1.37 years. And once your bulp broke down, i think LED-projectors are strong and affordable. At least thats my hope. Or i go another 1500h with a new bulp. The powerconsumption was measured with one of those plug-in-between-units, while powering off, the projector only eats 6W for the fan. The powercable is a default cable used with computers. The projector comes with a variety of settings like brightness, colourthemes, anti-trapezoid, etc. Also there seems to exist an infrared remotecontrol, which was missing with mine. If you want, you can also use the projector in back-projection mode or mounted up-side-down on the ceiling. Mounting was pretty easy for me, since i built a holder out of wood and screwed it to the wall. 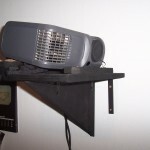 I think the projector has some standard-mount-holes so you can attach it to any holder that fits. One word on the so called rainbow-effect (RBE, see http://de.wikipedia.org/wiki/Regenbogeneffekt) that can be noticed with 1-chip DLP projectors. Since the chip can not show all three colors at the same time (red, green, blue that is, newer 3-chip models can), it needs to throw the colors one after the other on the wall. If you move your head quickly during a scene with lots of movement (or move your hand quickly in front of your eyes), you might see the colors of a rainbow, but i normally dont notice anything and am therefore a very happy home-cinema consumer. summing things up, i found a cheap way of throwing movies at my wall and im so happy with this product that i can just recommend buying one, if you are on the hunt for a projector and have the same requirements. Comming soon: distance and diagonal of image, projector in action. You are currently browsing the archives for the Volksbeamer category.